For our last card I decided to do a bit more sanding!! For these ones, I embossed white core cardstock with two different embossing folders. Sanding revealed the white core and contrasted nicely with the coloured outer layer. We tied some fake raffia around the layer before mounting it to a coordinating card front. The images had their edges distressed. I chalked the edges of the colour printed owl image (Graphics Fairy) and did not add any colour to the edges of the balloon image (CLKER). 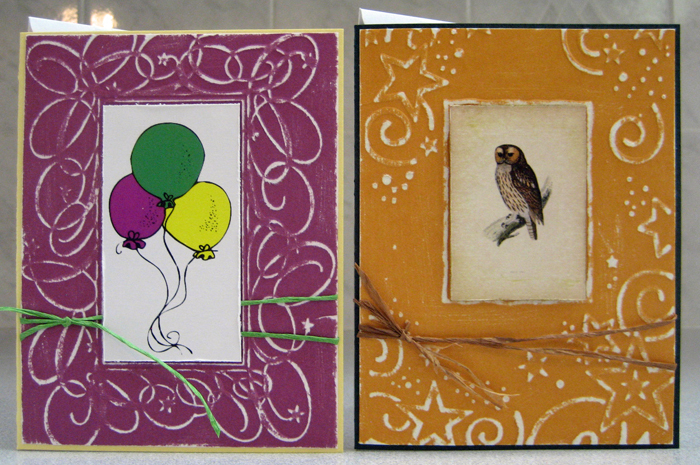 Both images were mounted to their respective card fronts using 3D foam tape. Another fun and creative evening of cardmaking!! !